Middlegate Burnaby Dentist offers your comprehensive oral care & dentistry in the heart of Burnaby. 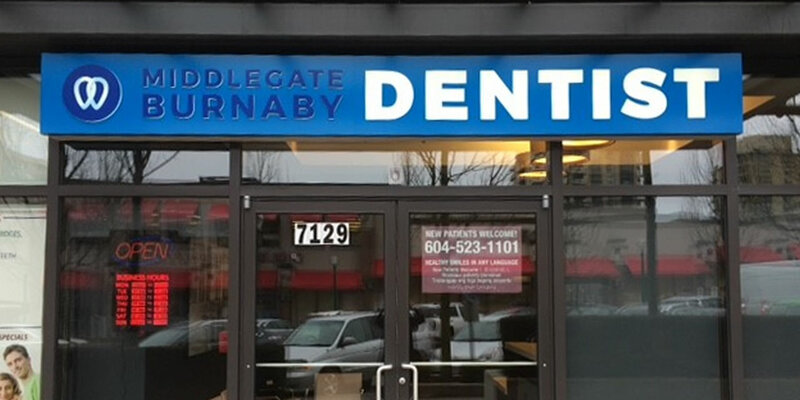 Middlegate Burnaby Dentist is a patient-focused dental clinic conveniently located in the heart of Burnaby near shops, parks and ample parking, as well as a 15 minute walk from the Edmonds Skytrain Station. We are proud to be a member of the 123 Dentist Community Dentist Network! Dr. Fazal graduated from Tufts University of Boston in 1997 and worked as a contract dentist for the US Army in 1999 prior to making his move to Vancouver and joining 123 Dentist. He is a proud member of the BC Dental Association and Canadian Dental Association, and attends many focused study clubs. Dr. Ebin Thaliath is a D.M.D graduate of UBC Dental School and has a keen interest in Root Canal Treatment. From 2003-2014 he had a practice limited to the specialty of Endodontics with Ministry of Health, Kuwait. After graduating from UBC, he continues to devote most of his time doing Root Canal Treatments. In his free time he enjoys spending time with his family and travelling. Excellent service. Attentive hygienist and dentist. Both listened and ensured they understood me. I got the sense of a very thorough assessment. My cleaning was pain free. Excellent! I do not usually write reviews but I had a great experience at this clinic. The staff were Super nice! My procedures were painless. Good job! Would definitely go back to this Dental office. They went over and beyond! Thanks again! The hygienist cleaned my child's teeth very carefully and thoroughly, I was satisfied. front desk girls were also kind and professional. I'm for sure I would go back. Amazing service from front desk to hygienist to Dr. Fazal. Highly recommended especially if you don't usually like going to the dentist because a lot of effort is made to make you feel comfortable. Dr. Fazal was wery professional and attentive to details. He located the source of my pain, which was not very obvious and suggested the proper treatment.